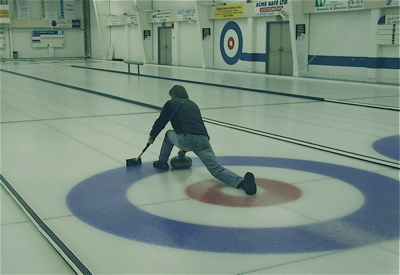 A rookie curler in Victoria, BC. Sue Frause photo. Somehow I missed this major sports news story from the CBC this summer: Olympic icemakers named. With the 2010 Olympics scheduled for Vancouver Feb. 12-28, 2010, they had to line up somebody to make all that ice. Two ice gurus have been appointed to the chilling task: Hans Wuthrich of Gimli, Manitoba and Dave Werklinger of New Westminister, BC. They'll be the technicians in charge of the men's and women's curling rinks, which will be located near Queen Elizabeth Park in Vancouver. Hillcrest/Nat Bailey Stadium Park will be complete in 2008. After the Olympics, the curling venue will become a multi-purpose recreation centre with an ice hockey rink, gym, library and 6-8 sheets of curling ice. A new aquatic centre will be attached to the facility, with a 50-metre pool and a leisure pool.